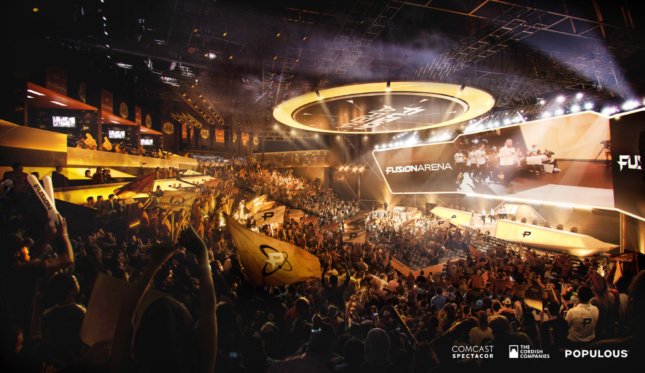 A $50 million, esports arena is coming to the South Philadelphia Sports Complex courtesy of designers Populous, Comcast Spectacor (Comcast’s sports and entertainment division), and developer The Cordish Companies. 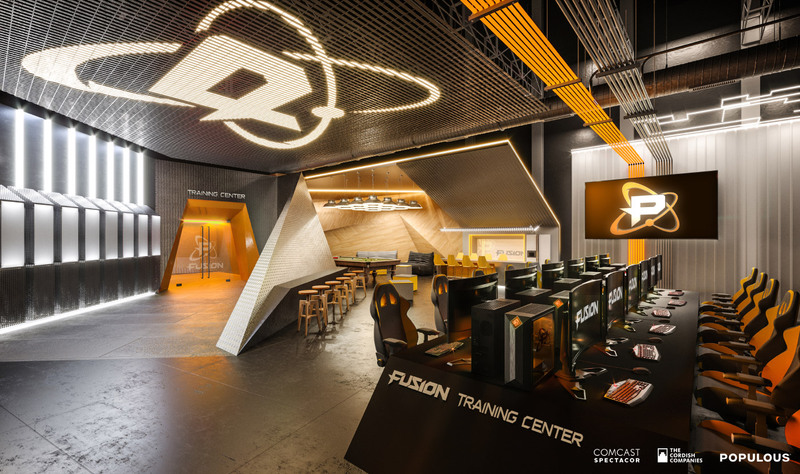 Once complete, the geometric Fusion Arena will hold up to 3,500 seats and will be the largest esports venue in the Western Hemisphere. Fusion Arena certainly isn’t the first competitive videogame venue in the country (before this, Populous’s Esports Stadium Arlington in Texas was the largest in the U.S.), and it likely won’t be the last thanks to the meteoric popularity of esports in recent years. The difference with this project is that the ground-up esports arena will house a Philadelphia Fusion esports franchise, similar to the professional-team-and-home-field-stadium model seen in traditional sports. Philadelphia’s new Fusion Arena from Architect’s Newspaper on Vimeo. 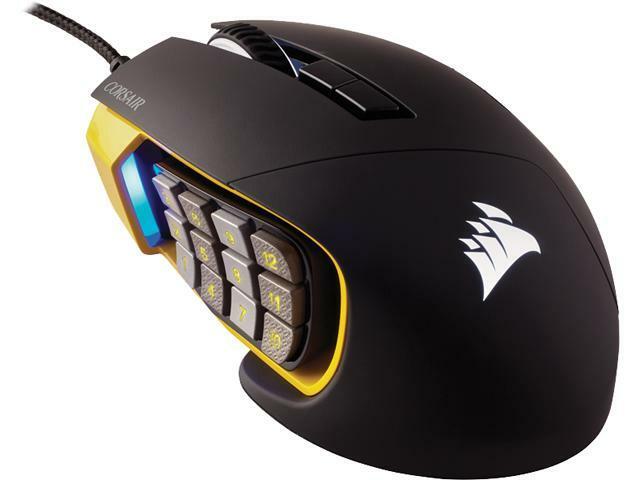 For the arena’s exterior, Populous took a cue from the angular, high-contrast world of gaming hardware and peripherals. The building’s vertically-striated black facade wraps several colorful overhangs and is reminiscent of a kitted-out gaming mouse in form. Industrial materials were used both inside and out in reference to Philadelphia’s manufacturing history. Other than the stadium seating, the building will hold a 10,000-square-foot training facility for players to practice in, as well as a broadcast studio for livestreaming, and team offices. A 6,000-square-foot, 30-foot-tall entrance hall will greet visitors. When not in use for competitive gaming, it’s expected that the arena will be used to host year-round live events. 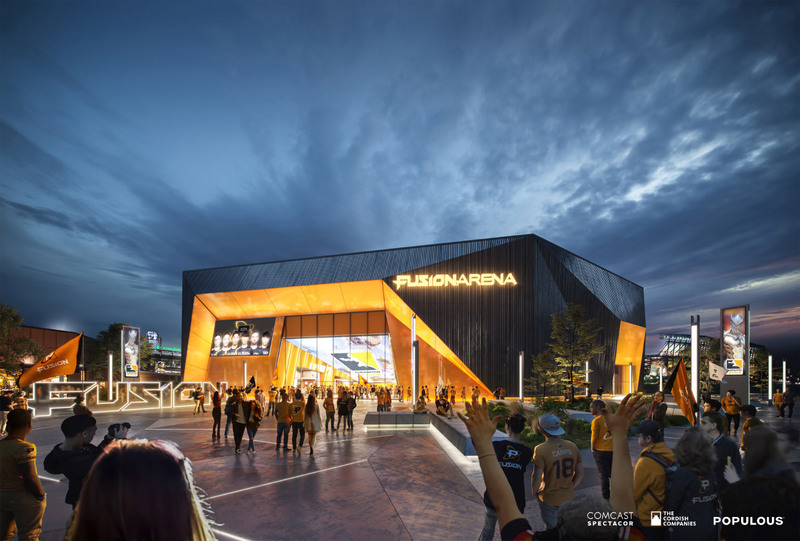 Fusion Arena is expected to break ground sometime this summer.